Back the beginning of July, the husband and I took off on a road trip around Florida. Think Serge Storms minus the creative murder and sidekick using copious chemical substances. So, you know, just the driving around the back roads of Florida part. Forbes, back in 2014, estimated the average American (who went on vacation, which is already abnormal), spent $1145 per person. StuffedSuitcase decided a 7-night vacation would cost her family (of 4) $4300. Now, the husband and I are only 2 people, so he and I should have, based on this, spent between $2150-2290, or about $2220. After getting back, I added up all our expenses and, minus a few souvenirs we sent to friends, we spent about $1185. Total. Now, I’m a lover of motels and campgrounds and state parks. We found some great lodging without using Air BnB or staying at a famous chain. We also spent $476 total on lodging, or an average of $79 for the six nights away from home. I’m also no fan of eating out all the time because a lot of the time I have trouble finding good vegan food that feels worth the money. Since I’m a big fan of parks, eating at picnic tables is a regular part of any road trip with me. More road trip savings tips here. Food costs can add up when traveling. Even if you’re just stopping at fast food drive-thrus, adult meals tend to run around $6-8 and they often leave you feeling either bloated and gross or hungry two hours later. Since we were driving, I packed a bunch of food in the truck and for all the meals we ate outside restaurants, we spent an average of $5 a meal. (road trip packing lists we used for cooking.) In 7 days, we spent approximately $220 on dining out (including the dinner we bought for friends, which works out to $22 per meal). Considering this included beer and wine, appetizers, and no holding back (ie buying a cheaper thing than wanted), I’d say we did pretty well. 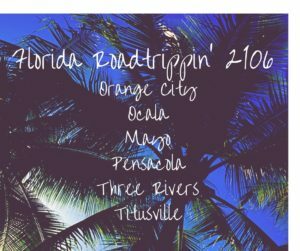 So, if you’re looking for a Florida road trip on the cheap(ish), here’s what we did.